This weekend was The 36th Annual New Food and Products Show at the Neal Blaisdell Center. My parents and I love to check this out every year. It is packed with a variety of booths featuring different foods, contests, entertainment, and different product inventions. Some examples include Local Stop, a food truck in the Waipio area which I fully intend to check out this week! What do they serve? A Malasada Burger?! Can you imagine it? A sweet, sugary bun cut in half and filled with a juicy burger, cheese and mushrooms?! Sweet and salty all in one- a match made in sweet sweet heaven!!! Now this is one of the reasons why I created my own blog- to find these amazing food creations and put them in your hands to try. Well, now, I'm getting a little ahead of myself...this post isn't on Local Stop. This post is fully dedicated to Fresh Catch, a restaurant and store located in Kaimuki (in the old Taco Bell/Pizza Hut) that sells everything fish/seafood! They sell fresh poke, sashimi, sandwiches and plate lunches. While I didn't get to go to their actual store/restaurant/fish monger yet, their booth at the Show was bumpin'. They did a great job of posting their menu that was big enough to see from down the aisle, plus they posted pictures of what their plates consisted of. They were also handing out samples, which is another plus. That is all you need to get me to buy from you! If I taste something I like, I am definitely ordering it! And that's basically what I did. "One Ahi Katsu plate, please!" And boy, was this bad boy delicious. For $10, this could easily feed 2-3 people! I loved the generous amount of furikake on top, plus their famous sauce that they sell by the bottle. The only thing I would ask for next time, is to cook the ahi on the more rare side. My friend who was helping me finish it, thought that he was eating Pork Katsu! Don't get me wrong, this dish was AMAZING. Fish was juicy and moist, plus the crust was crunchy! The sauce and furikake just pulls this spectacular dish together. 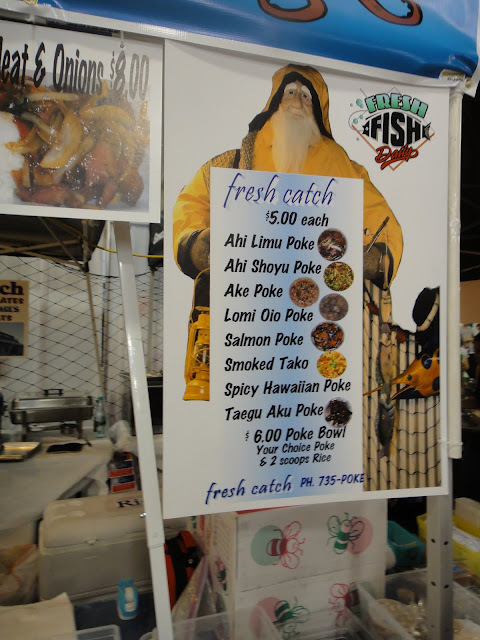 Fresh Catch was also selling all of their pokes for only $5 each! You could either just buy the poke itself or also order it with rice in a bowl for only $6!! What a deal! I did also sample almost all of their poke, and I honestly, liked everything I tasted. Fresh Catch may give Pa'ina Cafe a run for their money!!! Now, I have 2 "must-dos" on my list this week- 1) Head on over to Local Stop Food Truck in Waipio for their Malasada Burgers and 2) Stop by Fresh Catch to try another delicious plate lunch. I'm thinking Furikake Salmon? Or Ahi Crab Roll? Or Smoke Meat and Onions? Hmmm, life is tough!! Fresh Catch has a reputation for pretty good poke and other fish dishes. I've never been there myself but maybe I'll check it out after reading your posts. I've been going to the Food & New Products show for the past few years, but this year I didn't make it. Usually when I go I get in trouble for taking pictures. I guess they have something against people with pro DSLR cameras walking around taking pics. Yes you need to go and blog about it! It was one of the winners at the show, i thought. As much as i love Tanioka's and buying stuff from their booth, i was more intrigued by the ahi katsu, furikake salmon and all the other goodies fresh catch had! Can't take pics with your DSLR? really?? never knew about that. thats why my compact camera is so handy!! !